This show has an average rating of 4.92 out of 12 votes. This show has an average rating of 3.00 out of 1 votes. This show has an average rating of 4.00 out of 3 votes. This show has an average rating of 4.18 out of 57 votes. This show has an average rating of 4.67 out of 3 votes. This show has an average rating of 2.00 out of 1 votes. In total, over 40 musical artists hit the stages July 18-21 at the Legend Valley Concert Venue & Campground - located 30 minutes east of Columbus - in Thornville, OH. All Good's highly diverse musical roster includes artists performing from rock, bluegrass, indie, funk, electronica, collaborative jams and much more. Nominated for 2012 'Festival of the Year' by live music industry trade publication, Pollstar, All Good offers a unique festival experience of having side-by-side main stages with absolutely no overlapping sets throughout the entire weekend. Once onsite, attendees can also expect comfortable camping, RV camping, quiet family camping, artisan food vendors, diverse craft vendors, regional microbrews, designated bonfire pits, kids entertainment, drum circles, play shops, and endless options for entertainment. Tickets for the 17th Annual All Good Music Festival include all 4 days and nights of camping, parking, and all entertainment are available now at http://www.allgoodfestival.com/tickets. Early Bird Tier 2 general admission tickets are available now for a limited time for $189 and are $60 off the gate price. Children 3 and under are admitted free with a paying adult. In addition to Early Bird tickets, 'Even Better' VIP Packages offer a more enhanced festival experience including an exclusive concert viewing and camping area near the stages, private and air-conditioned bathrooms and showers, free festival taxi shuttles, premium All Good merchandise and more. Even Better tickets start at $460 and have consistently sold out in advance. 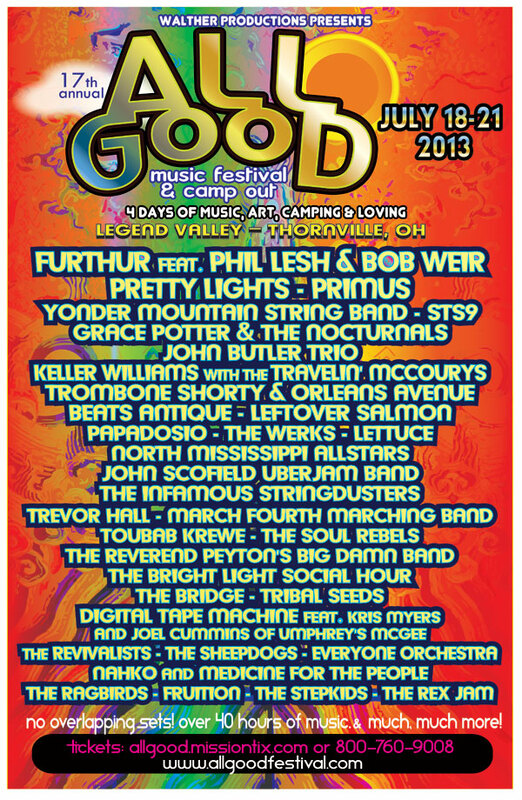 February 26, 2013 - (Thornville, OH) - The 17th Annual All Good Music Festival & Campout continues its exhibition of distinct and internationally recognizable talent as the festival unveils its initial 2013 lineup. Over 40 celebrated bands and musical artists hit the stages July 18-21 at the Legend Valley Concert Venue & Campground - located 30 minutes east of Columbus - in Thornville, OH. The historic site, formerly known as the Buckeye Lake Music Center, has hosted an illustrious roster of famous performers in the past including the Grateful Dead, Willie Nelson, The Allman Brothers Band and many more. The All Good Music Festival continues its unique experience of having side-by-side main stages and absolutely no overlapping sets throughout the entirety of the weekend. Fans are able to see every performance in full not having to worry about missing their favorite musical artists. Over the coming months, more than 20 additional artists will be announced adding to the highly diverse roster including rock, bluegrass, indie, reggae, Americana, funk, electronica, collaborative jams and much more. Once onsite, attendees can also expect comfortable camping, RV camping, quiet family camping, artisan food vendors, diverse craft vendors, regional microbrews, designated bonfire pits, kids entertainment, drum circles, play shops, and endless options for entertainment and safety. Tickets for the 17th Annual All Good Music Festival include all 4 days and nights of camping, parking and all entertainment are available now at http://www.allgoodfestival.com/tickets . Early Bird general admission tickets are available now for a limited time for $179 and are $70 off the gate price. Children 3 and under are admitted free with a paying adult.